Star Sydney Swans forward Lance Franklin welcomes the footy in his side's most recent clash with Melbourne. In the latest edition of Opposition Watch, Swans Media explores Melbourne’s camp ahead of the Sydney Swans’ SCG clash on Thursday night. Melbourne remains winless after the opening three rounds, having fallen to Port Adelaide by 26 points in its season-opener, Geelong by 80 in Round 2 and Essendon by 18 last Friday night. But the last-placed Demons are running third in the league in most contested possessions, with their 487 trailing just Port Adelaide’s 492 and Geelong’s 488. The Demons also eclipsed the Bombers in a number of key statistical areas at the MCG last week, edging their opponent in stoppages (24-22), inside 50s (63-53) and hit-outs (45-34). Young Sydney small forward Tom Papley said this week the Swans were expecting Melbourne to fire. Melbourne has made two changes to its side that lost to Essendon last week. Ruckman Braydon Preuss is set for his first game in Demons colours, and midfielder Billy Stretch will make his first appearance of the season, with Alex Neal-Bullen (omitted) and Kade Kolodjashnij (concussion) removed from the final 22. Preuss, who stands at 206 centimetres and tips the scales at 114 kilograms, played eight games for North Melbourne before being traded to the Demons at the end of last season. The 23-year-old Queenslander can bolster his new club as a tall target inside 50 or support star ruckman Max Gawn at the stoppages, while Stretch has played 38 games for Melbourne and offers his side a wealth of run on the wing. Keep an eye on 22-year-old Swan Isaac Heeney and 23-year-old Demon Angus Brayshaw, two of the most promising young stars in the competition. Heeney has shot to stardom since progressing from the QBE Sydney Swans Academy to Sydney’s senior list in November 2014, claiming the club’s 2015 Rising Star honour and proving to be of enormous worth to his side’s midfield contingent and forward line. Along with Josh Kennedy, Luke Parker and George Hewett, Heeney makes up the core of Sydney’s midfield rotation, although he paired 26 touches with four goals in last week’s win over Carlton in a brilliant inside-50 performance. Brayshaw has so too become a crucial element of his club’s midfield brigade since signing as the Demons’ first-round selection at the 2014 AFL Draft. The 61-gamer stood tall among a thriving Melbourne midfield unit in season 2018, averaging 26 disposals and 11 contested possessions per match. The MCG played host to one of the most entertaining games of the season when the Swans and Demons last butted heads in Round 21, 2018. Melbourne goaled to open up an 18-point lead early in the second term, and Sydney had just two men left on the bench after Alex Johnson and Nick Smith succumbed to injury in the opening half. 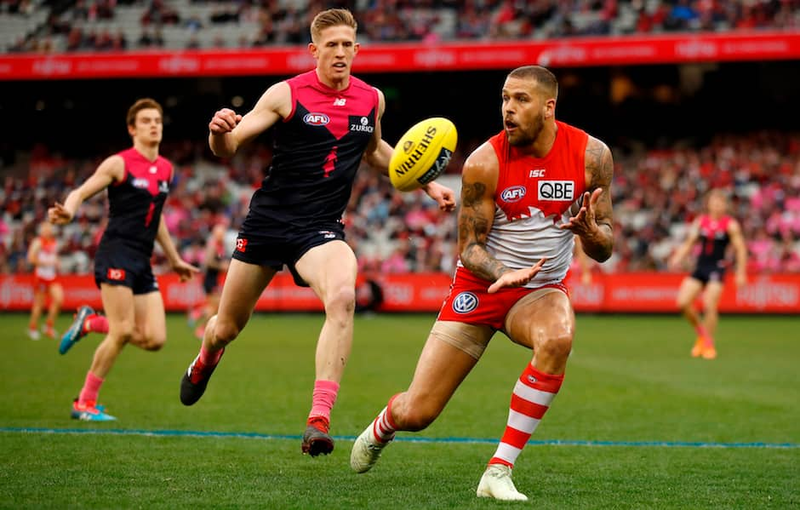 But the Swans snared seven consecutive goals across the second and third quarters to seize control of a 21-point lead, and a final-term Demons fightback would prove too little. The final stanza saw Heeney fly high above Melbourne’s Jesse Hogan to take what would be awarded the 2018 AFL Mark of the Year, before the Swans closed out the game in a nine-point win. Swans defender Jake Lloyd posted a game-high 31 disposals as Papley booted a match-high three goals, while Heeney (three Brownlow votes), Melbourne on-baller Clayton Oliver (two) and Sydney backman Aliir Aliir (one) were awarded best-on-ground honours.